The world’s top ten cities in terms of job creation through tourism are Jakarta, Beijing, Mexico City, Shanghai, Bangkok, Chongqing, Delhi, Mumbai, Ho Chi Minh City, Shenzhen, according to World Travel & Tourism Council’s (WTTC) Annual Cities Report released recently at the WTTC Asia Leaders Forum in Macau. The world’s top ten cities in terms of tourism market size are: Shanghai (US$35bn), Beijing ($32.5bn), Paris ($28bn), Orlando ($24.8bn), New York ($24.8bn), Tokyo ($21.7bn), Bangkok ($21.3bn), Mexico City ($19.7bn), Las Vegas ($19.5bn) and Shenzhen ($19bn). The report covers 72 of the world’s most important tourism cities, which together generated over $625bn contribution to GDP last year (24.3% of global travel and tourism GDP). Gloria Guevara, President & CEO, WTTC commented, “With 54 per cent of the world’s population living in urban areas, cities have become global economic hubs, driving growth and innovation. They attract huge quantities of people who travel to experience their culture, do business and live. This growth has also resulted in a rise in city tourism – a trend which is forecast to maintain momentum. Our report highlights the crucial importance of cities to travel and tourism worldwide, and likewise how vital this sector is to the economy. Over half a billion trips are made to cities annually representing 45 per cent of global international travel.” Of particular note, Chinese cities have matured rapidly over the past decade, and are forecast to continue dominating the growth charts between 2017 and 2027. Shanghai, for example, went from being the eighth largest city in terms of travel and tourism GDP in 2007 to become the largest in 2017 – a position it is expected to maintain until 2027. India will add around 10 million jobs in the travel and tourism sector by 2028, according to a latest report by the World Travel & Tourism Council (WTTC). WTTC forecasts that the total number of jobs related to tourism will increase from 42.9 million in 2018 to 52.3 million in 2028. 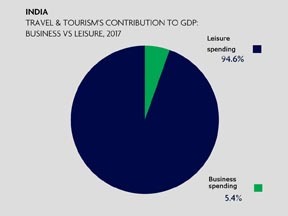 India is currently the seventh largest travel and tourism economy in the world. Overall, the total contribution of the sector to the economy was Rs 15.2 trillion (US$234 billion) in 2017, or 9.4 per cent of the economy once its direct, indirect and induced benefits are taken in to account. Gloria Guevara, President & CEO, WTTC, said, “Travel and tourism creates jobs, drives economic growth and helps build better societies. This is particularly clear in India which is forecast to be one of the fastest-growing tourism economies in the world over the next decade, adding 10 million jobs and hundreds of millions of dollars to the economy by 2028.” “Looking to the future, India can strategically lead travel facilitation within the SAARC region by introducing a standard technological solution, modern technology and biometrics. This will enhance the travel and tourism economies in the region. The Indian aviation market is expanding with rapid advancement in connectivity within India. Indian airlines have booked 900 plus new aircrafts to add capacity and expand operations over next couple of years,” Guevara shared.